I happen to be more familiar on the ship design stuff because our games have included ship designers for a long time so it's a topic we are pretty familiar with. Precisely. And the idea that P&F were demanding that you remove any fan designed ships that they didn't like (i.e. looked or were anything like anything from SC1/SC2) is complete nonsense. That feels a bit overstated to me. If people created images of something that is identifiably the USS Enterprise, or the Millennium Falcon, it's at least plausible that the respective copyright holders could try to demand that they be removed. Such works would be derivative works of the original. And while (unlike trademarks) copyrights do allow a "Fair Use" defense, it's applied on a case-by-case basis based on a number of subjective criteria, so it's not something that's very safe to rely upon. So IMHO (and IANAL! ), while P&F might not have a solid legal case on this hypothetical point, I don't think it falls to the level of "complete nonsense" either. Also, even if it's legally plausible, that doesn't mean it's a good idea. Sending a signal that you don't want your fans creating fan art is a great way to lose fans. While CBS or Paramount could potentially do that, it wouldn't be us they'd be contacting. It's none of our business what people create. The Ur-Quan universe based games have an extra obstacle: The open-source license allowing fans to do whatever they want provided it is non-commercial. Obviously, if P&F want to send cease and desist letters to their fans, that's their business. The Ur-Quan universe based games have an extra obstacle: The open-source license allowing fans to do whatever they want provided it is non-commercial. That's a good point, and one I hadn't considered. Stardock might still be potentially vulnerable, if that art was ever used in a way that could be argued provided a commercial benefit. For example, if such ship designs or images were posted in a place or manner that promoted SC:O. However, I agree that this should serve to protect fans from any issues of direct copyright liability, and also makes any related case against Stardock more difficult to pursue. I think demanding to remove Super Melee from SCO was a bit too much. Owning the SC trademark without Super Melee is like owning a car without an engine. PR obviously is pretty adamant at keeping all aspects of UQM exclusively theirs. I wouldn't be surprised if that was an emotional decision on their part. But Stardock did rename SCO's Super Melee to "Fleet Battles" is that correct? As for SC2 ship replicas, aka "mods", I think they're wasting their time there. In general, I'm particularly disgusted by this phase of this mess where the lawyers from both sides have taken over the rhetoric. 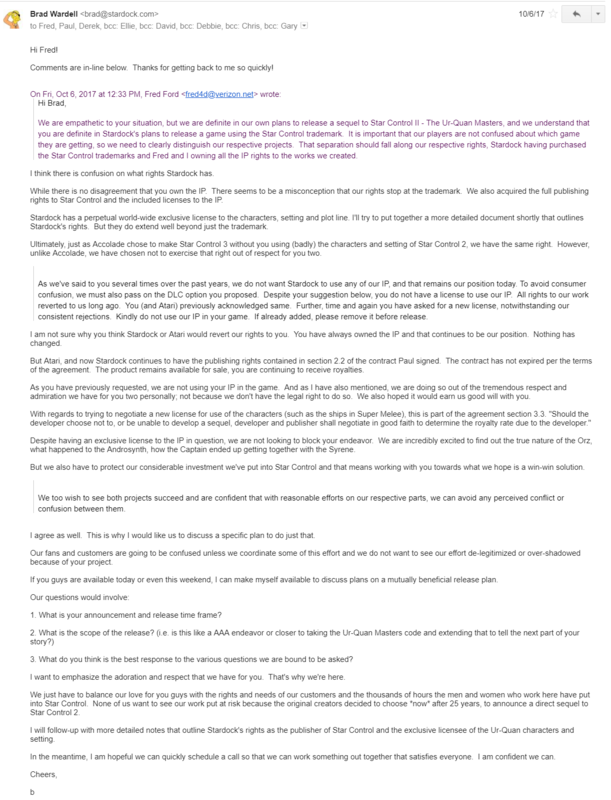 "PR&FF are not the creators of SC1-2" is just... let's just say there's too much evidence for the contrary and to suddenly make that claim this late (having a stake in the SC business just 5 years running) when they have been there since the beginning (almost 30 yrs now) - they would know what's rightfully theirs. But if you were to actually clearly say "you can create TIE Fighters or Serenity with the editor" to promote the game, that would be crossing the line or at least toeing pretty close, right? (AFAIK, IANAL) Have you said this to the public about creating SC ships? The Ur Quan Dreadnought is a Hydran ship from SFB with the Battlestar Galactica's hangar bays hanging off of the sides of it. It's even "Hydran Green". The Hydrans, in turn, were the Battlestar Galactica with the hangar bays removed. P&F had just put them back on. The Airlou is functionally an Andromedan, the Ilwrath is functionally a Romulan Falcon Mauler. If P&F can sue Stardock over these ships, then ADB can sue P&F for the same exact reason. 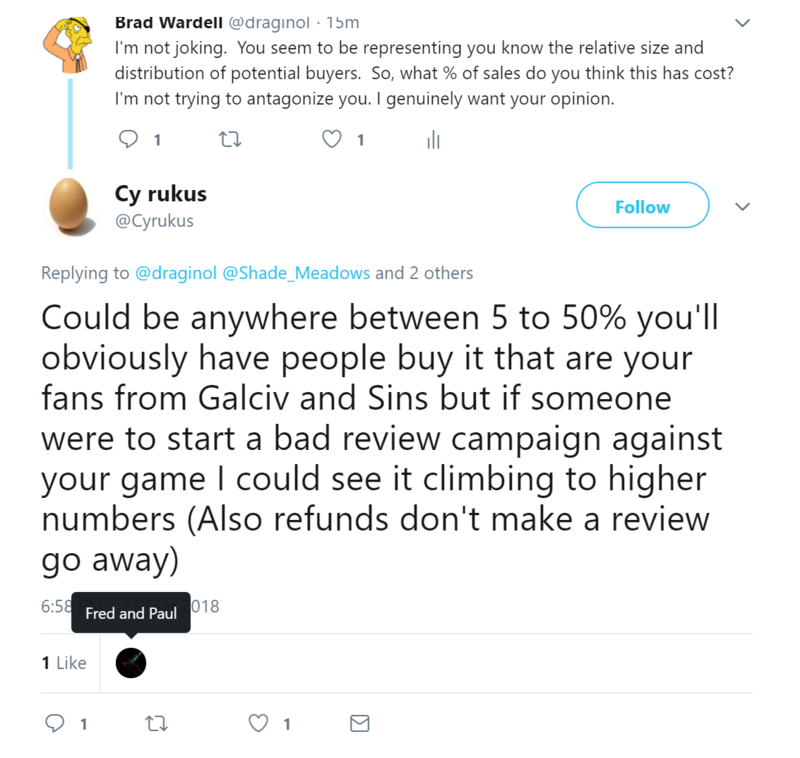 EDIT: In fact, P&F borrowed so much from SFB (without their permission, but that's a tradition in the computer game industry) that Stardock can probably get around many issues like this simply by going around P&F to the actual original source and getting ADB's permission to use them. But why bother with that when ripping off SFB is practically a tradition? ...so, when it comes to the Ur Quan, it's ultimately Glenn A Larson and the network that would have a lawsuit over ship design here. The Earth Cruiser's point defense weapon... SFB Gatling Phaser (Hydran). Like many SFB players, P&F were clearly big fans of the BSG inspired Hydrans. The Mycon's weapon... Plasma Torpedo is from the ST:TOS episode “Balance of Terror”. It is also the primary weapon of three SFB “empires” (Romulan, Gorn, Interstellar Concordium). Airilou weapon... Tractor-Repulsor Beam (SFB, Andromedan). Airilou device... Displacement Device (SFB, Andromedan). Ilwrath weapon... Mauler Cannon (SFB, Coalition). The Coalition is the alliance of the Klingon, Lyran, and Romulan empires. They all have Mauler Cannons. Ilwrath device... Cloaking device. Star Trek/SFB. Sophixti... This guy, both the pilot and ship, were lifted from an early Apple II game called “Starfox”. Thraddash... Fast Patrol Ship with warp booster packs or “Hot Warp” engines. SFB (All empires). Ur Quan fighters... Hydran Stinger fighter. Diamond shaped wedges with point-blank only beam weapons. Khor Ah weapon... Transporter bomb. SFB (All empires). Khor Ah device... Expanding Sphere Generator. SFB (Lyran). I could go on but I think the point is coming through here. P&F can make no claim to the design of the ships or any aspect of “Super Melee”. They did not “create” that aspect of the game. Steve Cole did, and they “borrowed” it all from him. Super Melee was just P&F's vision of SFB as an arcade game. If anybody is suing anybody over the ships or Super Melee it would be Steve Cole suing P&F. P&F came up with the overall structure of Star Control, which is a significant thing. It is a “perfect game” in many ways in that regard. And they wrote the story. The ships, the tactical combat environment, Super-Melee... That's Steve Cole, not P&F. Exactly. This "Creator" hub-bub is probably something P&F really would have been better off not stirring up. Here's a link to their GDC talk: https://www.youtube.com/watch?v=Napx0MjivCM&t=2821s back then they were known as the "Designers". Star Control is a spectacularly designed game. But that's not the same as being THE creators of it. I've worked on a lot of games over the years and I don't refer to myself as "the creator" even though I think I would have a pretty legitimate claim on Galactic Civilizations (as I designed, wrote, programmed, paid for, and owned). Referring to P&F as the designers of the game only, apparently, became a great offense in the past few months. Prior to that, that was the title they went by. What changed? I think we know exactly what changed. They want to imply that Ghosts of the Precursors will have the same magic that Star Control had by giving the impression that "the creators" of Star Control are on it. Sorry, that's ridiculous. Take away the dream-team talent they had on the original Star Control and we wouldn't be talking about it today. If Fred did all the programming and Paul did virtually all the rest then I think they'd have a much better claim on the phrase "THE creators". You know, sort of like what I did with the original Galactic Civilizations for OS/2 (which I also paid too by working miserable night jobs while also going to college). It's not just that they had a team of other people that were also involved. Even accepting Greg Johnson's defense of P&F of having been the “driving force” behind SC2, games, books, movies, etc, are always derivative. As just one example from the story of my own universe/story, in my story the universe is a single living entity. Everything in the universe is just a part of that single living entity. It's all one living being, with a collective consciousness present in all of its components. This is somewhat “unique and original” when compared to the major modern sci-fi universes that take a far more “scientific” perspective on the universe. But, at the same time, it is not “unique and original” at all. The Force from Star War could be interpreted as being this same thing. I have no idea where this concept originated, but I would imagine it was with the “classic” sci-fi authors that my step father loves so much... Asimov, Hienlien, Clarke, etc. From a literary stand-point, it is impossible to write a story that experts in that field can't trace back to William Shakespeare in some way, shape, or form. Any modern sci-fi story will be influenced, either directly or indirectly, by the original sc-fi authors from HG Wells on. And also the “more modern” sci-fi like Flash Gordon, Buck Rodgers, Star Trek, Star Wars, Battlestar Galactica, Babylon 5, etc. Like any sci-fi story, Star Control's story was a blending of all of these things. And there are plenty of direct references too these older stories in the SC2 story... just like there are in anyone elses sci-fi story. P&F's, Stardocks, mine... anybody's. We all bring our own unique perspective too our own stories, but in many ways we are all also telling essentially the same stories over and over again. So, what is it that P&F are claiming is “entirely, uniquely ours”. Super Melee is Steve Cole. The Ur Quan DN is Glenn Larson. The Star Trek influences in SC2 (there are many) are Gene Roddenberry's. I don't know what P&F are specifically claiming, I haven't bothered to read anything about this outside of these forums. But the things people are saying here don't belong to P&F, and they weren't their ideas whether you are talking about the game or the story. Like any sci-fi storyteller, most of their story was derived from previous sci-fi stories. Most of their game was derived from Dungeons & Dragons and Star Fleet Battles. They didn't “create” some entirely new thing unlike anything that had ever existed before. Just like everyone else, the simply arranged things in a way that suited their taste and style. Just like everyone else, there were only a few (a very few) things in SC2 that they weren't “borrowing” from those who came before them. Nobody thinks that The Wire is solely the work of David Simon. He had many people helping him (much more than SC2), including writers, directors, camera crew, and of course a fantastic cast. But Time still thinks it's appropriate to call him "creator" of The Wire, and a quick search will show that this headline is not an isolated journalistic slip-up. Far as I know, Dominic West, Aiden Gillan, Idris Elba, Michael Kenneth Williams, and other immensely talented people who made the show what it is don't think credit is being stolen from them by giving Simon this title. Also, the complaint goes well beyond saying "they should be called designers, not creators" to suggesting they weren't meaningfully involved in SC2 at all. There is a big difference between "having help" and other people doing most of the creating. Stardock's complaint does not suggest they weren't meaningfully involved. I suspect if David Simon was doing his series for say, Netflix instead of HBO, there might be some issues involved in that description. Also, there is a big difference between a third-party calling you something and you claiming the credit yourself both morally and legally. It is very unusual in our industry for people to refer to themselves as "The Creators" unless the people in that list actually did the vast majority of said creation and/or actually OWN the creation (PF compare themselves to George Lucas except that Lucas actually owned Star Wars). I agree it's pedantic. Stardock isn't the one who made a public issue of it. Star Control is a spectacularly designed game. But that's not the same as being THE creators of it. [...] If Fred did all the programming and Paul did virtually all the rest then I think they'd have a much better claim on the phrase "THE creators". What I can and will say is that Paul and Fred created both of those games. It was really the two of them, and others like me and Erol and whomever just contracted and did bits and pieces under Paul's direction. This Universe, Story, Characters and Gameplay all come from the amazing mind of Paul. That's enough for them to qualify as "The Creators" in my book. I suppose others could draw the lines in different places, but equating "Creator" with "Sole Creator" seems like splitting hairs, and outside normal parlance. 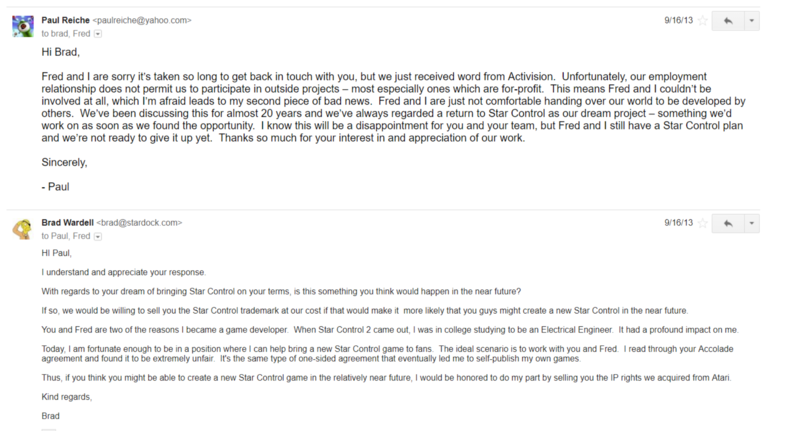 If the other people who were there are good with P&F calling themselves "The Creators of Star Control", then, IMHO, Stardock is stepping out-of-bounds when it steps in and tries to create a distinction about "Creators" 25 years later. Referring to P&F as the designers of the game only, apparently, became a great offense in the past few months. Prior to that, that was the title they went by. What changed? I think we know exactly what changed. They want to imply that Ghosts of the Precursors will have the same magic that Star Control had by giving the impression that "the creators" of Star Control are on it. 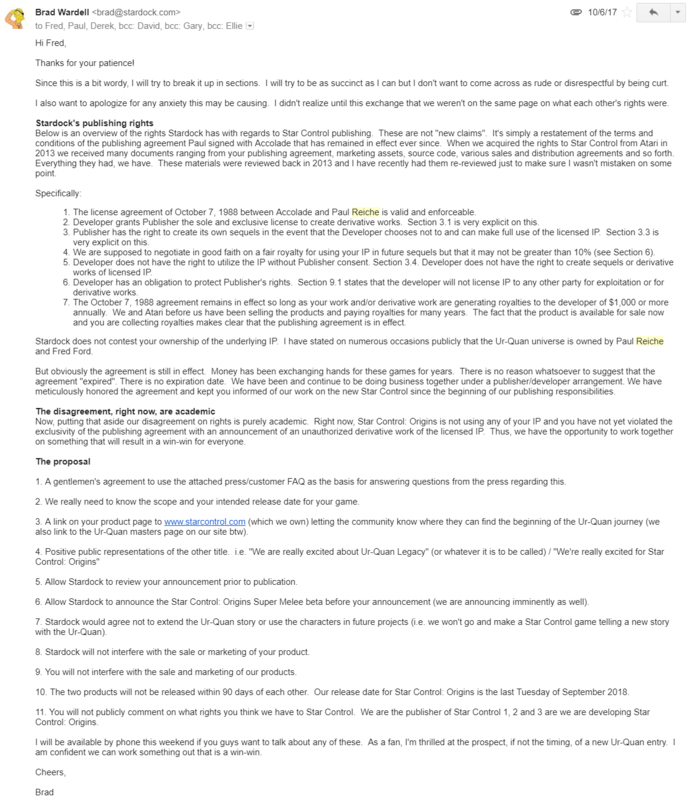 My impression, which you are welcome to rebut, is that nobody cared whether P&F called themselves "Designers" or "Creators" until Stardock's lawyer disputed the usage in Stardock's complaint (paragraph #49). I presume that the lawyer's intent in doing so was because "Creators" has legal significance to copyright ownership, and they wanted to try to delegitimize Paul's copyright claim. As a legal tactic, I understand this. If SC2 was worked on by Accolade employees, or by outside workers without any copyright assignment, it could really muddy the waters, giving Stardock a legal advantage; you didn't know the Accolade contract details at that time. But when those details came out in Paul's counterclaim, they strongly supported his sole claim to the copyright; the other contributors appear to have been subcontracted by Paul, not directly employed by Accolade, and presumably, although we haven't seen it, those subcontracts included a copyright assignment to Paul, which would make him the "Creator" from a legal standpoint as well as by colloquial use (IANAL, of course). So IMHO, this whole "Creators" argument is a legal tactic from Stardock that is actively backfiring. IANAL, but I think that the Accolade contract language makes this claim unlikely to succeed in court, and Stardock is doing itself a huge amount of PR damage pushing the argument. You've been saying that this is all about the trademark, not the copyright, and you've got a much stronger argument there, so I hope that Stardock stops digging this hole deeper, and instead refocuses the discussion on the arguments where it has a stronger case. What did they "create"? As far as I can tell, they "created" the characters. Everything else is derived from the previous work of other people. This is pretty much always the case in books, movies, and games. The adventure game is an RPG/Adventure game inspired by D&D, Super Melee is SFB. The story is a blending of previous sci-fi stories. Just as with my own story, the only thing that they (or I) seem to have actually "created" are the characters. And, even then, I'm guessing a literature professor would be shaking their heads at all three of us and saying "They didn't create Fwiffo, he's similar to this or that character. You didn't create Cindy McAllen, she's similar to this or that character". I understand that P&F may have legal rights to something, and I am guessing that in the end that is the characters. Even "The Precursors" were not their idea, in the Star Fleet Universe they are called "The Old Kings" and I'm sure that idea doesn't originate with SFB. Very little is "new" when it comes to storytelling or games, it's all been done before. We are not "creators", or even "designers"... the most accurate term would be "composer". You're right, in that most new creative works are built on things that come before. But if that argument were taken to its logical extreme, we couldn't have any copyrights, because nothing is really new. But copyright law does recognize derivative works, and if I was a copyright lawyer, I could try to comment on how the line is drawn between a legally derivative work that's close enough to require authorization, and an informally-but-not-legally derivative work that doesn't cross that line. But I'm not, so I won't. I'll just say that the line exists, and if Stardock decides to push that argument, a court would have to decide. That's right, like others keep saying, I am not a lawyer. I am speaking in terms of "ethically, morally, and evolutionary". The law often arrives at a completely different decision, the most obvious being that murderers sometimes get set free on a legal technicality even when everyone knows that they are guilty. 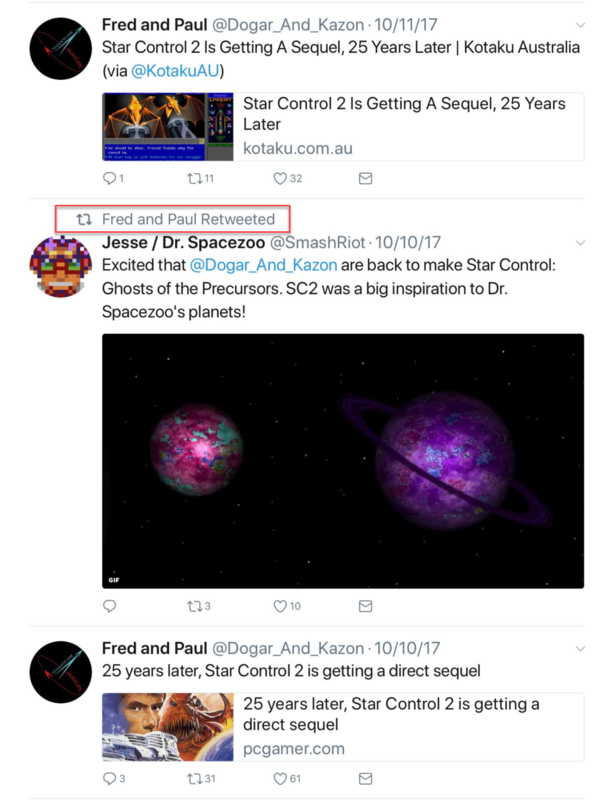 If Paul & Fred as seeing these posts, and I suspect that they are, I want them to know that I am a big fan of theirs and always has been. As an experience, I think Star Control II was the very best computer game that I ever played. I think they should consider what I am saying, and realize that very little of SC2 was actually "theirs". They seem to be thinking in terms of "we invented all this from scratch and there had never been anything like it before". If they are entrenched in this way of thinking, they will be taking unreasonable positions in this dispute. All things are evolution. Evolution is everywhere, not just in genetics and life. Most "ideas" that anyone ever has can trace themselves back thousands of years to their original source. I consider my story to be "mine". It's my take on a sci-fi universe. There is a lot of me in it in how I have "arranged and composed" it all. But, in reality, there is very little in it that originates with me. This is the case for all "creators" of any type of fiction. Even my "Rube" is based on the work of others going back centuries, I am just "arranging and composing" it differently than anyone else has ever done before. While I deserve some type of credit for that, at the same time I never could have arrived at it without the previous thoughts, ideas, and work of many other people over a period of centuries. Even Rube is not really "mine". I can't speak to the law, only what I perceive to be the ethics of the situation. I would hope that Paul & Fred would realize that what they did was based on, and built upon, the work of many people who came before them and that, in reality, there is very little in SC2 that was "uniquely theirs". I obviously disagree with your views on this. Stardock wouldn't be making an issue of it except for PF now trying to associate themselves with Star Control to compete with it. IF they had announced their new game as Ur-Quan Masters II and said they were the creators of Star Control we wouldn't be here now. But they didn't. They announced it as the true sequel to Star Control and promoted themselves as THE creators of Star Control. And when we objected they started attacking the distribution of 25-year old DOS games and calling us thieves. Stardock wouldn't be making an issue of it except for PF now trying to associate themselves with Star Control to compete with it. And the trademark certainly gives you the right to make an issue of it. My point is that in the statement "From the creators of Star Control", I think your argument should be focused on the words "Star Control", not "creators". To the best of my understanding, their use of "creators" is irrelevant to your trademark claims; it only matters if you're trying to attack their copyright. IF they had announced their new game as Ur-Quan Masters II and said they were the creators of Star Control we wouldn't be here now. But they didn't. They announced it as the true sequel to Star Control and promoted themselves as THE creators of Star Control. 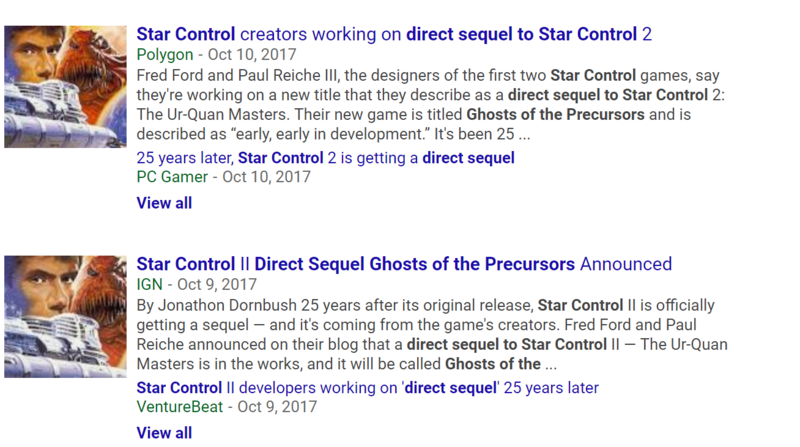 To be precise, their announcement was "...we are now working on a direct sequel to Star Control II® -- The Ur-Quan Masters, called Ghosts of the Precursors™". This has slightly less proprietary connotations than "true sequel". They still should not have used your mark without permission, but I believe that they have since corrected their infringing post. If so, the only question left should be how much harm they caused by using the infringing wording, instead of the proper wording. 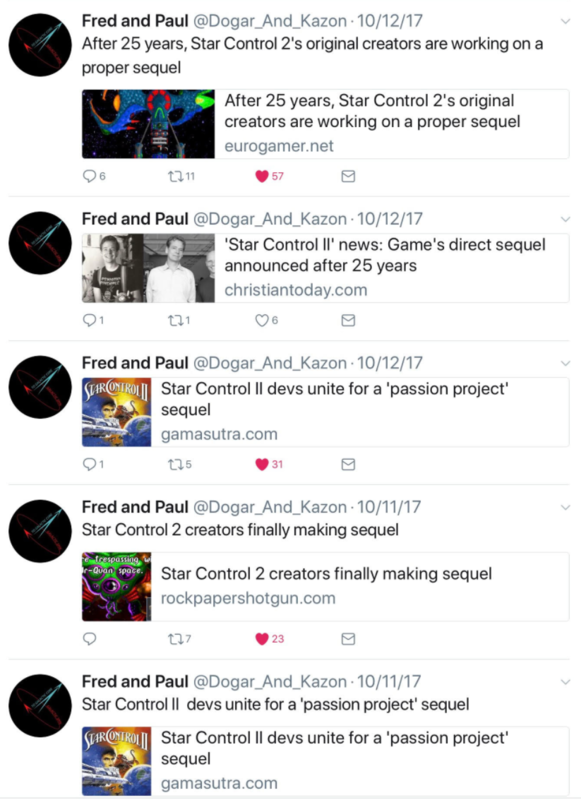 Personally, I think the real harm was probably small; the press and fans would have filled in the blanks whether or not they actually used the words "Star Control", and the effect would have been almost the same. Maybe you could agree to forgive their infringement, if they agree to drop their demands about policing fan art and using "Super Melee"? And when we objected they started attacking the distribution of 25-year old DOS games and calling us thieves. I agree that the accusations are really not helpful, and my current impression is that P&F have not been communicating very well throughout this whole disagreement. My understanding is that because of the IP split, both Stardock and Paul probably need to agree on any sales of the old games via GoG or Steam, so he had the right to block sales, but he should have started with a polite email to you, rather than a DMCA takedown. For 'really not helpful' insert 'libel'. Jafo goes back to 'sitting on hands'. Just so I can form my own opinion, can you point me to the allegedly libelous statements? They also refer to it as the "true" sequel in many other places online. See exhibits. To be precise, their announcement was "...we are now working on a direct sequel to Star Control II® -- The Ur-Quan Masters, called Ghosts of the Precursors™". This has slightly less proprietary connotations than "true sequel". They still should not have used your mark without permission, but I believe that they have since corrected their infringing post. If so, the only question left should be how much harm they caused by using the infringing wording, instead of the proper wording. Actually, they called it a true sequel in their original post. some of our own time to creating a true sequel." 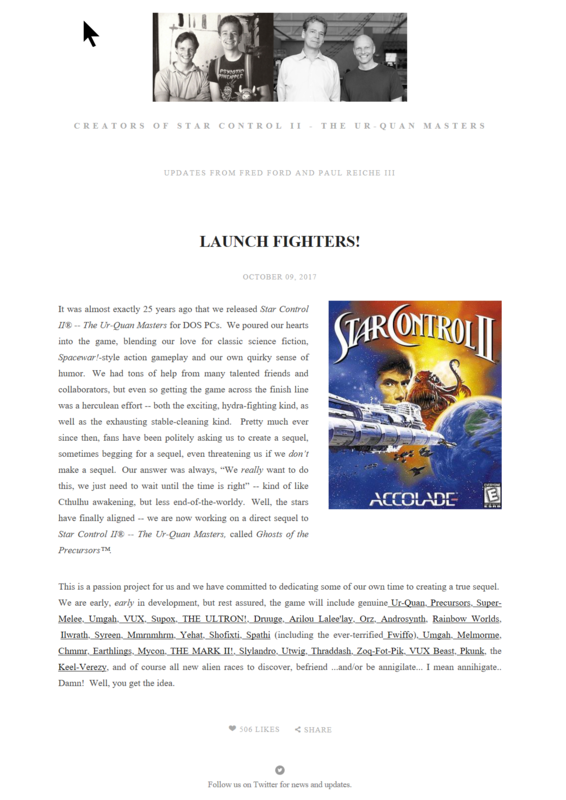 We have never had a business relationship with Stardock and are creating independently a direct sequel to our 1992 game, Star Control® II -- The Ur-Quan Masters. 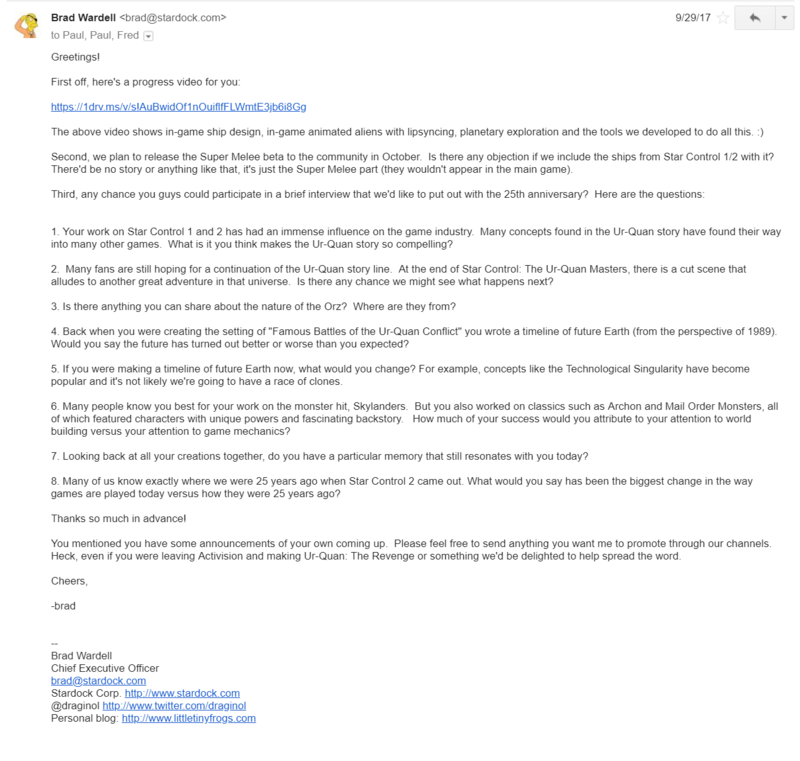 We are doing this outside of Toys for Bob (per the Gamasutra article) as a passion project." "This is a passion project for us and we have committed to dedicating some of our own time to creating a true sequel." Ah, thanks; it looks like there were two places in the announcement where they talked about 'sequel'; in one that called it 'a direct sequel', in the other, 'a true sequel'. I hadn't noted the second. Still, the real problem was not that they called it a sequel, whether 'direct' or 'true'. 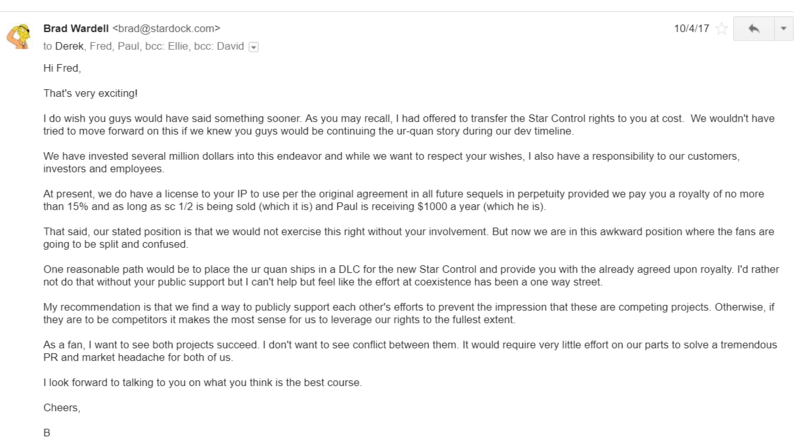 The problem was that they called it a sequel to 'Star Control', thereby forcing Stardock to defend its trademark. EDIT: Also, *sigh*, for the old comments on bluesnews, from when it sounded like everyone would be getting along for the two efforts, instead of getting so *frumple*.